Multnomah is bordered by SW 45th Ave. on the west, SW Capitol Hill Road on the east, SW Vermont St. on the north, and I-5 in the south. Exceptions are the area north of SW Nevada Ct. and east of SW 26th Ave. (part of Hillsdale), an area south of SW Multnomah Blvd. and north of SW Dolph St. where SW 48th Ave. is the western border, and an area south of SW Marigold St. where SW Capitol Highway is the western border. The neighborhood is bordered by Maplewood, Ashcreek, and Crestwood on the west, Hayhurst and Hillsdale to the north, and South Burlingame, Markham, and West Portland Park to the south and east. A bit of Portland history played out in the Village on April 7, 1987, when Mayor Bud Clark fired Police Chief Jim Davis while the two were having a breakfast meeting at the Fat City Cafe. The neighborhood celebrates "Multnomah Days" with a parade and street festival on the third Saturday of August. Multnomah Village was, for a long time, home to the world's first wiki, WikiWikiWeb, which was physically located in an office there. The website has since relocated. The village features prominently in the 2011 independent film Rid Of Me, although its locale is cited as fictitious Laurelwood, Oregon. The Multnomah School (1913) has, since 1979, served as the Multnomah Art Center. ^ Swanson, Lowell (2009). "Multnomah: The first hundred years". Multnomah Historical Association. 13 (1): 11–14. 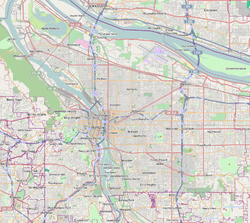 Wikimedia Commons has media related to Multnomah, Portland, Oregon. This page was last edited on 18 February 2019, at 22:09 (UTC).